The SEA is part of the national MSP process. However, the SEA Protocol of the Espoo Convention obliges Parties to assess at an early planning stage the environmental impact of certain projects entailing possible trans-boundary impacts. The SEA is therefore often also connected to transnational consultation processes. Please also see topic Cross-border Cooperation. Strong stakeholder involvement is key to any SEA, thus practices are also interrelated to the topic Stakeholder Involvement. The Ecosystem-based Approach (EBA) is also highly related, as SEAs are seen as one concrete tool to implement EBA in MSP. Overall, there is a lack of documented SEA practices clearly describing the methodology applied, particularily in relation to MSP. So far practices mainly come from Baltic Sea and North Sea sources. Most of the practices are dealing with the SEA in relation to a specific (pilot) plan combined with recommendations for planners on how to carry out SEAs in future MSP processes. In some (not all) cases specific reports are available explaining the methodology applied, for example the first SEA documents for the German North and Baltic Sea developed for the MSP in the German EEZs. Also Swedish, Estonian, and Latvian experience on SEA is meaningful and interesting. Since maritime spatial plans are likely to have significant effects on the environment, they are subject to Strategic Environmental Assessments (SEA Directive (2001/42/EC). SEAs are an important tool for integrating environmental considerations into the preparation and adoption of ’Plans’ and ‘Programmes’. They complement the preparation process of Maritime Spatial Plans, providing a mechanism for the strategic consideration of environmental effects, assessment of plan-alternatives and potential development of mitigation measures. They also contribute to the implementation of the Ecosystem-based approach, as it frames the evaluation of effects on species and habitats of conservation importance. the extent to which certain matters are more appropriately assessed within a more detailed Environmental Impact Assessment (EIA), which is often required for the licensing of specific projects after a Maritime Spatial Plan has entered into force. What examples exist of SEA reports prepared for MSPs, and what are the key variations in application of SEA? There are few examples of existing SEA reports for maritime spatial plans, including Germany, UK, Lithuania, Malta and the Netherlands, which are listed here. In Poland, a pilot SEA project was undertaken through BaltSeaPlan (the Pilot SEA for the Western Gulf of Gdansk) which considered how to prepare the SEA report for maritime spatial plans including consideration of impacts on Natura 2000 sites. SEA has also been undertaken for the Estonian Pärnu Bay Plan, which is legally binding and will inform MSP. The BaltSeaPlan report offers comparison how the SEA has been carried out in terms of ecological concerns in two different MSP areas, the German EEZ of the Baltic Sea, and the Gulf of Gdansk. It provides lessons to be learned on SEA for MSP through showing differences on how to approach SEA and providing general recommendations. This includes developing agreed definitions of ‘significance’ in relation to impacts, and the importance of thorough and iterative stakeholder engagement throughout the process, including the use of tools (particularly matrices) to clearly communicate impacts to stakeholders, public and interested parties. Ensuring that the accompanying appropriate assessment process is informed with detailed information on the conservation objectives of Natura 2000 sites and species was also recommended to avoid difficulties in this aspect of assessment. The extent to which SEA is integrated into the MSP process. In some cases, the entire SEA process runs parallel to the MSP process, providing input on potential environmental impact continuously on the Maritime Spatial Planning process. In other cases, the SEA is one-time assessment, conducted during a certain planning stage. The choice of the method is also related to whether the MSP authority is also responsible for the SEA. Resources available, including institutional capacity for delivering SEA, particularly data gathering and analysis, and stakeholder engagement which is particularly resource-intensive. While consistency is neither achievable nor desirable, awareness of the differences is useful when communicating on SEA, and when considering how approaches in a particular case may be slightly amended based on experience elsewhere. A certain level of coherence is being pursued through some initiatives in order to facilitate transboundary consultation and SEA in relation to trans-national infrastructure (please see the related FAQ below "Are recommendations available on how to carry out trans-boundary consultation as part of an SEA process?"). How are ‘alternatives’ considered in SEA of MSP? The SEA process requires consideration of the effects of ‘alternatives to the plan’ which is presented in the environmental report. Interpretation of ‘alternatives’ varies across different contexts; in some processes the alternative is defined as ‘no plan’, and the options are simply therefore the proposed plan, or considering the implications of not implementing the plan. This approach was taken in the SEA of the German MSP, leading to conclusions that the MSP will have overall positive effects on the marine environment, because of the measures included within the plan (including marine protected areas and other spatial management), and that without the plan, proposed activities would take place in any case but without the protection measures outlined within the MSP. It is also possible to use the requirement of SEA to assess plan alternatives to consider different scenarios for an MSP, varying the scale of development, location, etc., to explore the relative ecological effects. Realistic alternatives may be difficult to set out, since the components of the MSP are often driven by specific policy drivers (such as a requirement for a certain level of offshore renewable energy), but there may be potential to consider other options within these boundaries, such as configurations of development, relative composition of different renewable energy technologies, etc. In Estonia, alternatives to the plan are not looked at in an ‘either’ / ‘or’ approach, but the plan is continually refined based on iterative rounds of consultation, so that a preferred development scenario within the plan is agreed. How does SEA relate to other planning processes such as Environmental Impact Assessment and Appropriate Assessment? SEA forms part of a hierarchy of environmental assessment which informs decision making from the strategic level (policies and programmes), and relates to Environmental Impact Assessment (EIA) undertaken at the project level. SEA is mandatory for plans and programmes implementation of which are likely to have significant effects on the environment, which include MSP. EIA is mandatory in relation to specific proposed activities i.e. public and private projects, which are listed in Annexes I and II of the EIA Directive (85/337/EEC). The SEA environmental report includes information that may reasonably be required, taking into account current knowledge and methods of assessment, and the content and level of detail in the MSP. It will highlight which activities are more appropriately assessed at the more detailed EIA stage, which is often required for the licensing of specific projects after a Maritime Spatial Plan has entered into force.A SEA has an important role in guiding EIAs, since the challenges in reconciling some issues at the EIA scale require a more strategic approach, for example addressing impacts to mobile species such as marine mammals and birds. 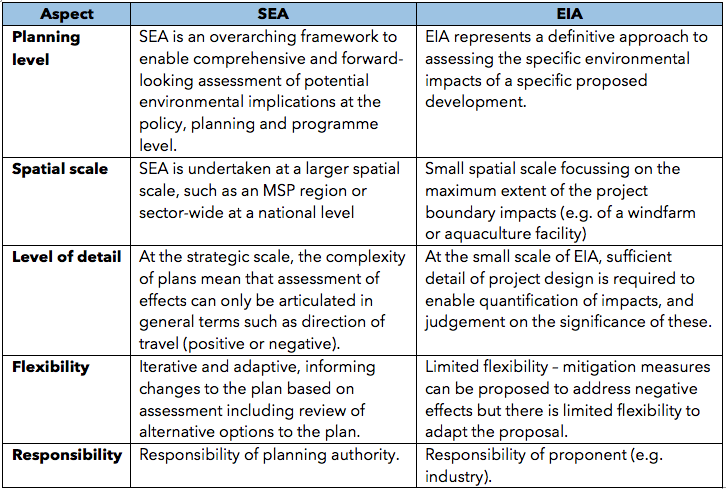 Key differences between SEA and EIA are presented in Table 1. There is often understandable confusion regarding the difference in the level of detail between SEA and EIA, given that both are intended to reach conclusions on whether potential impacts are significant or not. Quantifying impacts and defining thresholds of what is significant in terms of risk of impact on ecological features is arbitrary at the strategic scale. Even where guiding thresholds may exist (such as in relation to sensitive bird populations in a region), it will not be possible to accurately predict the risk posed by a yet to be developed multi-sector MSP. However, as identified in the analysis of the Polish experience of SEA in relation to MSP through the BaltSeaPlan report, it is necessary to communicate in the SEA what criteria has been used to conclude whether the potential ecological effects are acceptable or not. Such issues need to be clarified in each context in order to manage expectations of the level of detail presented through an SEA. In Natura 2000 sites, appropriate assessments (AA) have to be carried out when plans and / or projects have potential to affect the integrity of a site. This means that the Competent Authority would undertake AA for MSP before they can be adopted, and for specific projects following EIA. The Adaptive Marine Policy (AMP) Toolbox was developed to assist policymakers, including local, national, and regional authorities, to address the requirements of the Marine Strategy Framework Directive and GES (Good Environmental Status) of coastal and marine ecosystems in the Mediterranean and Black Sea basins. What role can cumulative impact assessment tools play in SEA for MSP? Cumulative impacts are a key aspect of SEA for MSP, given the broad scale and diversity of proposed development and the need to conclude at a strategic level on the risk of significant ecological effects. A report describing several cumulative impact tools for MSP, shared during an from an expert roundtable organised by the EU MSP Platform, can be found here. Examples includes the Symphony tool developed in Sweden, which provides an analytical tool to estimate the cumulative environmental impact during the planning process on national level. The Adriplan Cumulative Impact Tool is the main methodological tool used in ADRIPLAN to evaluate the potential impact of maritime activities on the environment in current and future scenarios. This tool provides an example of how to understanding cumulative impacts, as a key aspect of developing maritime spatial plans using an Ecosystem Based Approach (EBA). Cumulative impact assessment tools are highly dependent on the quality of data used and care is needed in interpreting the results. A critical perspective is needed in order to understand and communicate the uncertainties involved in such complex, model-based assessments. Applying different tools and comparing results provides a method of testing the predictions made. Further information on cumulative impact tools for MSP can be found under the question "Are there practices available to find out more about the application of cumulative impact methodologies?" on the Ecosystem-based Approach FAQ page. How are the SEA and MSP processes integrated? SEA provides a way of incorporating consideration of ecological effects into the MSP process. SEA and MSP can be simultaneously, to ensure that SEA is informed by the most up to date plan. The understanding gained through assessment and consultation through SEA, can be used to refine the design of the MSP. However, the extent to which the processes are integrated varies according to the implementation within each country. In some countries the SEA process is a limited activity and only influences the MSP process at a certain stage, for example when the first draft MSP is being produced. For an overview of MSP per country and whether a SEA has been conducted, please see the country overview tables. Both processes are mutually informing, and pre-determined connection points between SEA and MSP (e.g. through the scoping stages, consultation, etc.) can support effective transfer of information. Co-ordination of consultation processes can also ensure rapid incorporation of the views of stakeholders and demonstrate coherence. Although the SEA process is more limited in scope and resources, there can be a need to align some of the required stakeholder engagement for SEA and MSP, which would address the challenges of overwhelming stakeholders with requests to input to different processes. However, some separation between SEA and MSP is also appropriate, and there are advantages and disadvantages, for example, to both processes being led by the same authority. This can be mitigated to some extent through the use of external contractors (as is required by law in Latvia) who may provide a level of independence to the assessment and associated consultation processes. What is the relationship between the ESPOO convention and MSP? The Espoo Convention requires national authorities to notify and consult each other on all major projects under consideration that might have adverse environmental impact across borders. The Convention entered into force in 1997 and is complemented by the global Protocol on Strategic Environmental Assessment to the Convention on Environmental Impact Assessment in a Transboundary Context, or the ‘Kiev Protocol’ (Kiev, 2003). The Protocol requires its Parties to evaluate the environmental consequences of their official draft plans and programmes by conducting Strategic environmental assessment (SEA). Such plans and programmes are detailed on Annex iii of the SEA Protocol and the criteria listed mean that maritime spatial plans are subject to SEA. The Kiev Protocol is transposed into EU legislation through the SEA Directive (Directive 2001/42/EC). This interaction between global and EU instruments under the auspices of the ESPOO Convention therefore provides a framework for the assessment of transboundary effects, including between EU and non-EU member states. For the essence of the SEA in relation to the Espoo Convention please see the video introducing the Kiev Protocol. Are recommendations available on how to carry out trans-boundary consultation as part of an SEA process? Article 10 of the Kiev Protocol under the Espoo Convention sets out the requirements for trans-boundary consultations. It defines whether notification is needed, what it should contain, the procedure for entering into consultations, and necessary arrangements for consultations. In brief, notification is required when the implementation of a plan or programme is likely to have significant trans-boundary environmental effects. Notification should be as early as possible in plan development, via the country nominated Points of Contact (listed on the Convention website). The detail of the notification varies depending on the scope, extent and foreseen effects of the plan or programme in question, but in general the responsible authority should provide the details of the draft plan or programme, the environmental report and information regarding the decision-making procedure, including an indication of a reasonable time schedule for the transmission of comments. Other information, such as public information materials and other background documents may also be required. So far there are only few examples of the SEA trans-boundary procedures related to MSP plans. For instance the trans-boundary MSP pilot in the Bothnian Sea reflects in chapter V on impact assessments required for an SEA and its requirements when preparing for certain sectors. It also provides information when setting the framework for the consent of future development projects listed in annexes to the EIA directive. In Germany SEAs (SEA for the Baltic Sea, SEA for the North Sea) have been elaborated for the two EEZs as obligatory part of the MSP process. SEA was conducted in relation to the Estonian Pärnu county development plan, which is legally binding. The SEA process was carried out as a trans-boundary process with Latvia. At the very beginning of the process, Latvia was informed of the planning process and the SEA. The SEA results and the plan were presented to Latvia after the planning proposal was drafted. There is potential for overlap between transboundary consultation for SEA and cross-border consultation through MSP, and co-ordination between the processes could be efficient and effective, for delivery of the plans and to make effective use of stakeholder resources (as they need to be consulted on MSP, SEA, MSFD, etc. and may not understand the relationship between each). Are there recommendations available for how to carry out a trans-boundary SEA process with regard to offshore grid infrastructure and cable routing? Proposed infrastructure projects such as trans-national electricity transmission and cabling which affect many countries present challenges for SEA. Due to limited experience the recommendations how to carry out a trans-boundary SEA process for offshore grid infrastructure and cable routing are scarce. This is being addressed through projects such as the SEANSE project, which aims to develop a coherent approach to SEA for cross-border energy projects in the North Sea. Currently, member states take different approaches to SEA, which makes integration across borders challenging. This project to develop a coherent approach will support the development and effective implementation of MSPs in the region. This will include the SEA undertaken in Germany for the German Spatial Offshore Grid Plan, which set out an overarching plan for strategic transmission infrastructure, to which subsequent offshore windfarms would connect. Progress towards coherence and integration can also be expected from the on-going INTERREG projects: Baltic-Integrid (Integrated Baltic Offshore Wind Electricity Grid). Guidance produced by the Seanergy 2020 project, including the Recommendations for Adaptation and Development of Existing and Potentially New International MSP Instruments, may also help in scoping the SEA reports for cross-border energy projects. The Latvian MSP is a national level long-term (up to 12 years) spatial development planning document that shall define the use of the sea, considering a terrestrial part that is functionally interlinked with the sea and co-ordinating interests of various sectors and local governments in use of the sea. The MSP covers territorial waters (out to 12 nautical miles) and Exclusive economic zone (from 12 nautical mile). Overview of all relevant legislation regulating maritime activities and their impact on offshore renewable energy projects; input to the evaluation and identification of inconsistencies with the offshore renewable energy plans. Practices for consenting process for ocean energy in different countries, including handling of Environmental Impact Assessments for consenting process. The purpose of the Strategic Environmental Assessment (SEA) Guide is to offer practical guidance on how to do SEA in an innovative and sustainability oriented way, using strategic thinking.